Admittedly, in order to explain this, I have to go back a little. Basically all Tennessee whiskeys are such “hybrids”. This is simply the case because a Tennessee Whiskey always fulfils the conditions to be a Bourbon Whiskey, but not vice versa. 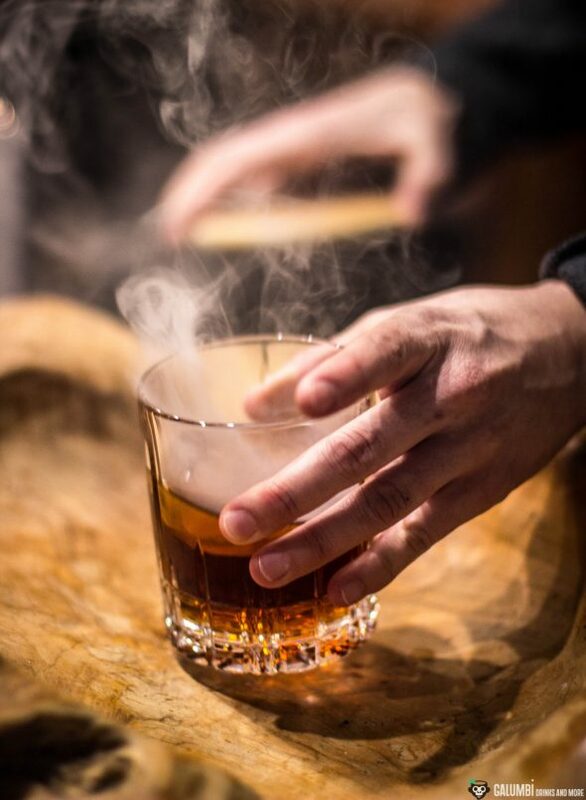 Since 2013, American law has stipulated that Tennessee whiskey must be produced in the state of Tennessee and it must have undergone the Lincoln County Process: The whiskey is filtered through charcoal from sugar maple before it is matured in barrels. So far, so good. However, if we look at today’s bottle, we see that it is a bourbon bottled in Kentucky. Since we do not know from which distillery this whiskey actually comes, there is not much else left but to rely on hearsay. 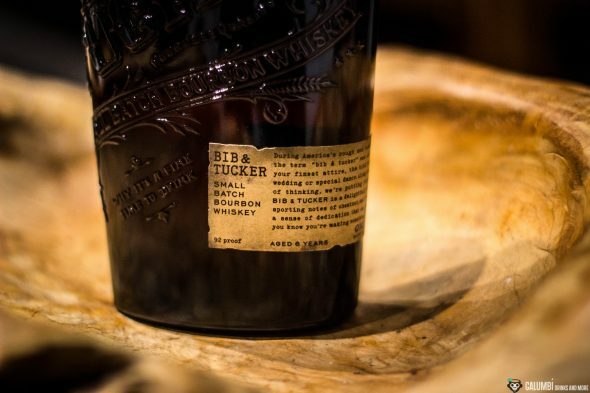 And most of those same rumours say: The Bib & Tucker Small Batch Bourbon – that’s its name – is distilled at George Dickel in Tennessee. Of course, I can’t resolve whether that’s really true, but if that’s the case, it would seem very interesting to deliberately market the whiskey as bourbon and to indicate Bardstown in Kentucky as the bottling place. According to the declaration, this is not a Kentucky Straight Bourbon Whiskey at all. 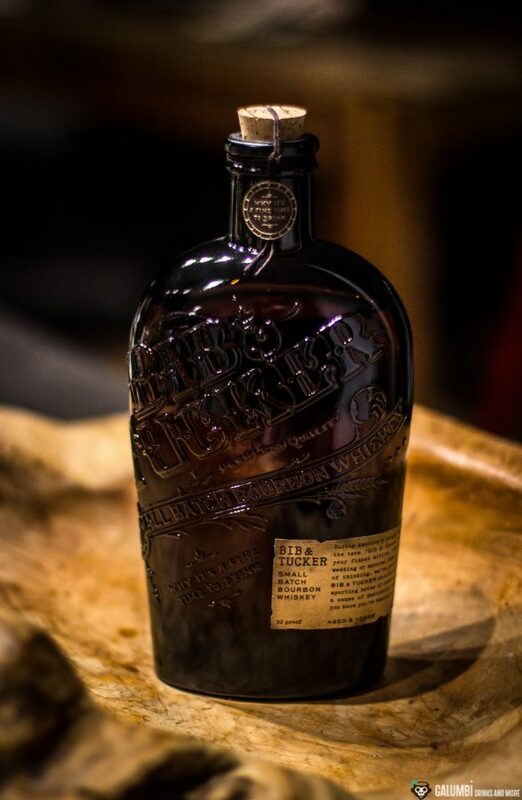 Which again gives food to the rumours that it comes from George Dickel from Tennessee, because a mere bottling in Kentucky is not enough to market it as Kentucky Straight Bourbon Whiskey (for that it would have to be distilled there and also matured there for at least one year). In short, whether this whiskey may not come entirely from Kentucky (unlikely given the arguments), or whether it is a Tennessee-Kentucky hybrid (more likely), whether it comes from George Dickel or another distillery… we don’t really know all these things. But what we do know is the age of at least 6 years indicated on the bottle. In addition, we learn from the manufacturer that it was distilled twice: first on a Column Still, then on a copper Pot Still. The mash consists of 70% corn, 26% rye and 4% malt. The whiskey is bottled at a promising ABV of 46%. The name Bib & Tucker is a term that during the 18th and 19th centuries was an expression for very fine clothes worn on special occasions. In the end, it is just a nice story to give the product a premium coat of paint. 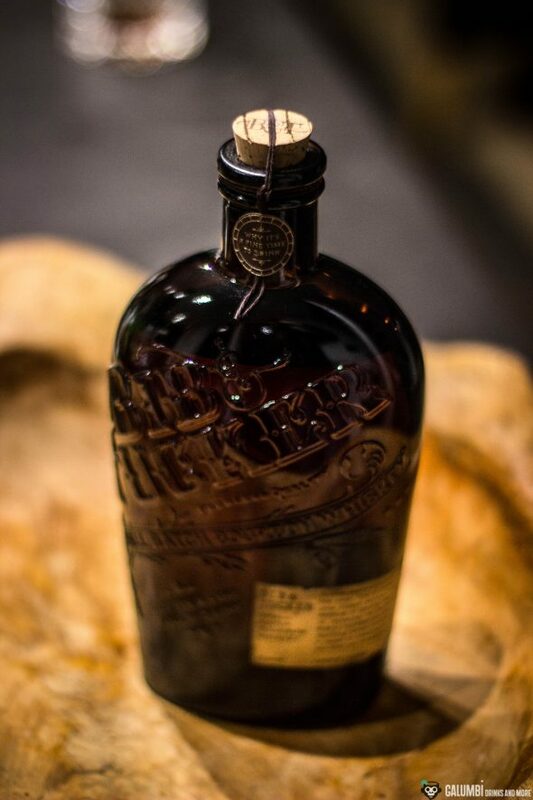 The very beautiful and really well designed bottle also contributes to that. Now enough of the preliminary skirmish, let us have a look on the essence. Aroma: notes of caramel, vanilla, subtle honey and nuts, plus the chestnuts announced on the label. A slightly fresh, herbaceous note also enters the stage; I can particularly isolate mint and some thyme. The aroma profile is quite complex and appealing, but overall remains relatively mild. Taste: the Bib & Tucker is surprisingly spicy and expressive on the palate. Quite pronounced notes of cinnamon and herbal tones (mint, coriander) combine with oak wood, vanilla, a beautiful orange and a hint of lemon peel. Over time, some cotton candy comes through which softens the rather powerful first impression. Finish: again, I can find some coriander, bitter notes of oak, but also orange peel. The finish is relatively long. A nice Bourbon, which I definitely like! 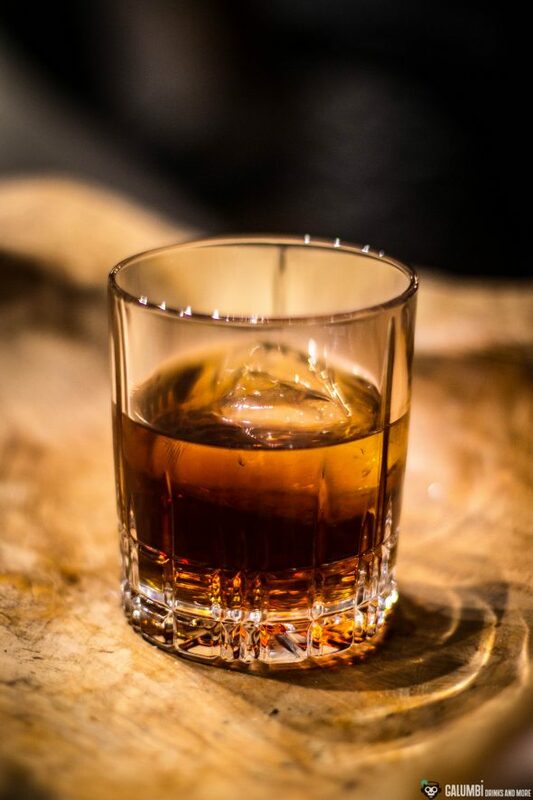 When it comes to a cocktail, I have opted for a drink that leaves the Bib & Tucker Small Batch Bourbon Whiskey enough room to unfold, but still makes a lot of difference. Such a drink is the Revolver Cocktail by Jon Santer, who invented it in the early 2000s in San Francisco. This combination of Bourbon (in the original it’s the Bulleit Bourbon), coffee liqueur (mostly Kahlúa) and Orange Bitters is simple, but very successful. 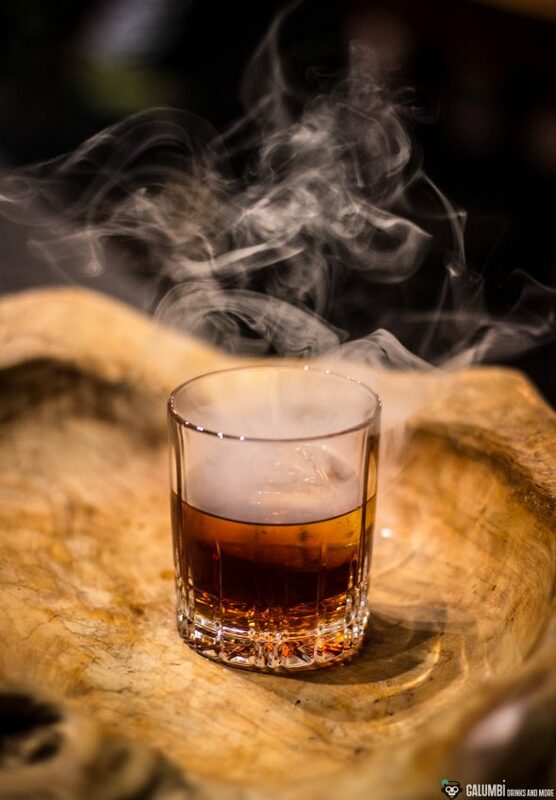 But I tinkered a bit with the drink and gave it a Spanish touch: I flavoured the cocktail with smoke (I let some hickory wood chips steep in Pedro Ximenez sherry overnight and then collected the smoke of it with a smoking gun under a glass dome together with the drink). Instead of Kahlúa I chose a Galician Abadía da Cova No.3 Licor Café de Galicia. Preparation: Mix all liquid ingredients briefly in a glass filled with a massive ice block. 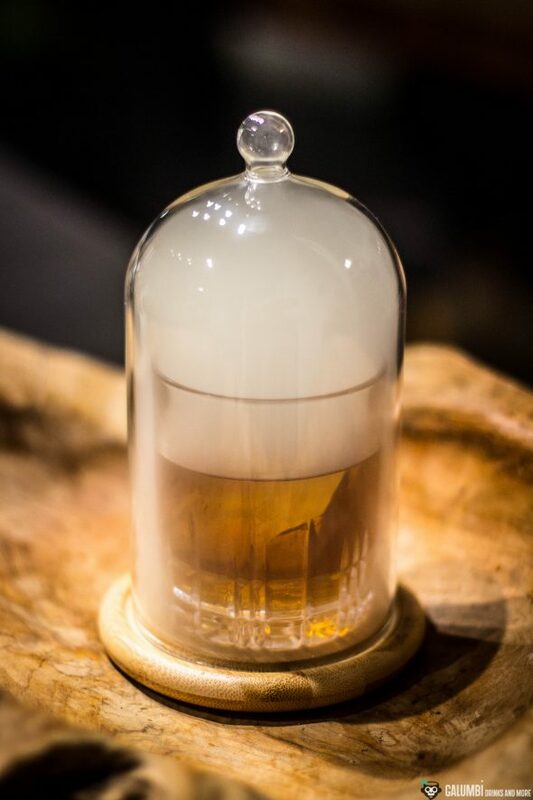 Finally, place the drink under a glass dome and smoke for no more than 5 seconds (! ).